Automatic Transmissions / Sports Transmission? Was there some option or are they all the same? There's one advertised locally with a sport transmission and since I've only had sticks, I haven't a clue. Different for sale, but it shows the 1,2,D3,D4 and there's a lock on it? Or are they all like this? Re: Automatic Transmissions / Sports Transmission? I have never heard of a sport automatic for the Accord. You might be able to adapt the automatic from the 1997-2001 Prelude, which had the H22a engine standard (the 1992-96 Prelude with the H22a engine was manual only). But not only are they rare, but I'll bet it's the same transmissions, just with steeper gear ratios for better acceleration. So, no, pay no attention to this. Thanks. I don't know if they made up the sports transmission on a 1991 EX or it's the standard transmission with some inventive eBay name on it. I've only had stick Hondas for over 20 years. Girlfriend had a Prelude but that had a + and minus, not numbers. Upshift and downshift. Car sold, with minor rust, 1991 EX wagon, on eBay for around $2,500 - no mention of conversion or adapted shifter. I'm still waiting for a stick. I mean I'd even take a 1997 EX four door at this point. The 98-01 SIR Wagon (non-US only) had the Sport Triptronic automatic like the last-gen Preludes. You can tell because it's got kind of a 'squiggle' shape instead of a straight line for the Automatic shift positions. And it'll have a "+" and "-" in addition to the P N D4 D3 2 1 markings. The 6th Gen SIR Wagon only came with that transmission, though - no stick shift. (and of course RHD and the H23A-VTEC blue top engine). Yeah typical eBay "rare" and making it up as they go along. I've seen stuff that makes you shiver about coins and collectibles that's imaginary creative writing. Anyone know how many 1997 EX wagons were made with the manual, or how to find a real number? I had someone say that here the number tossed around was only 100? WOW! That means rarer (yeah I know I just did it myself) than some of the limited edition sports super cars. Of course demand is important and we are small dedicated numbers. And for the LX I'm just as surprised and I don't see many with manual at all. Just automatics. If the 5 on your shift knob is .05% larger than the 4, you do have the unlimited-slip, comfort-shift version that fetches high dollar in the right circles. That ones not mine, it was on eBay. I think it was creative writing. "sports transmission"
I'm trying to find here or anywhere, how many 1997 EX wagons were made with a manual transmission? Someone else on the forum said there may have been a thread about the production numbers? Only 100? I haven't been able to find that information. Yes my girlfriend had a Prelude, it was fun. She buys some nice cars, and I drive a Honda Wagon? Well we both like the wagon, pretty attached to it after all these years, many long trips. Here's the visual on the Triptronic Honda gate. Yes it isn't just straight. Fun to drive with control. But usually just put it in the auto mode. When in the left hand slot it was + or - for gear shifting, up or down, just give it a push. Now that would be the only way for an automatic on the wagon. Yes pretty much all my cars have been manual transmissions since my first was a Mini Cooper S in 1968. I have had some really dull second cars, mini vans, a Rambler wagon, a Chevy Malibu wagon, Plymouth Volare wagon (really nice slant 6 ran forever) some second hand beetles. But primary cars were Fiat 124, Mazda rotary RX3, VW Thing, a string of Hondas = two identical Wagovans, CRX Si. 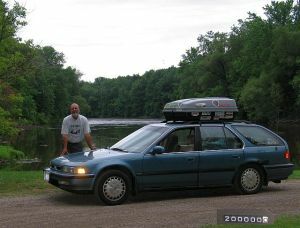 The Honda Accord EX wagon I've had for about 16 years, if I remember right. There were zero 5 speed EX wagons in 1997. When they introduced the CE-1 the manual was available on both EX and LX models. They did not make or sell many EX 5 speeds so they dropped the option. 1995-97 only had a manual transmission available on LX models. I have been trying to find any info on production numbers of any sort on CE-1's. I can't even find wagon specific production numbers. I used to work at a Honda dealership and the only help the owner could give me was, "They didn't make many. I think we had one 5 speed EX wagon in 1994."